Bletchley Park Concentration Camp Decodes. For the latest updates please visit this discussion forum thread: Committee for Open Debate on the Holocaust. For the first time ever, we begin publishing original documents from the WW2 British Intelligence archives, relating to the inmate populations in various concentration camps as recorded in 1942 / 43. This article is intended as an introduction to these documents and to promote understanding of their origin, composition and use. Some of the detail in these archival sources can be complicated and demands appropriate analysis from experts. It is anticipated that experts in the worldwide audience will be be able to add much needed analysis and interpretation and will be able to place the detail within the appropriate, historical context. However, it is recommended to first read this introduction and all of the published sources, prior to offering comment, asking questions or attempting analysis. Comments can be submitted using the Contact Form, or alternatively, follow or join in the discussion thread above. Professor Sir Frank Hinsley's Revelation. Since the publication in 1981 of F. H. Hinsley’s multi-volume official history, British Intelligence in the Second World War, it has been known that British Intelligence had been intercepting and decoding radio messages sent by the “German Order Police” - the Ordnungspolizei or ORPO. This crucial wartime intelligence was the direct result of earlier Polish efforts in breaking German Police cyphers. The "medium grade" security cyphers were originally designated code names, PEARL and later, PINUP by the code breakers at the Government Code and Cypher School (GC and CS), latterly based at Bletchley Park (BP). Among the myriad "German Police" (GP) decrypts, as they were generally referred to at Bletchley Park, were messages concerning the suppression of resistance and subversion, especially in Poland and the Baltic States, in the Balkans, in Russia and Italy. Hinsley revealed that, for the first two years of the war, the ORPO “simple hand cyphers” were at times also used by the Security Police (SIPO), the Criminal Investigation Branch (KRIPO), the Secret State Police (GESTAPO), and the Security Service, Sicherheitsdienst (SD). Together with the high security Enigma messages known as ULTRA, these combined decrypts provided a vast repository of intelligence, part of which concerned the reprisals inflicted by the Germans in the course of their anti-partisan operations. The decodes between July and August 1941 for the paramilitary ORPO, used in close collaboration with units of the SS, gave at least seven examples of mass shootings on the Eastern Front, with victims described variously as Jews, Jewish Plunderers, Jewish bolshevists or Russian Soldiers. These messages also provided the British with intelligence of victim numbers, ranging from less than a hundred to several thousands. What is less well known, is that Hinsley also revealed that these decoded messages yielded significant and primary source details of the “daily prisoner returns”, transmitted by the various concentration camp establishments to the controlling camp bureaucracy. These decoded "German Police Concentration Camp" or GPCC HORHUG figures, described as the concentration camp “vital statistics”,  contained totals for the inmate populations at several concentration camps, including Dachau, Auschwitz and Buchenwald. “From the spring of 1942 until February 1943, when it ceased to be sent by W/T, GC and CS decrypted in another cypher a daily return of prisoners at Dachau, Buchenwald, Auschwitz and seven other concentration camps – not all of them, but a good cross section. * The daily return consisted of a series of unheaded, unexplained columns of figures which GC and CS worked out to mean (a) number of inmates at the start of the previous day, (b) new arrivals, (c) departures by any means, and (d) number at the end of the previous day. It also specified the various categories of prisoner, such as politicals, Jews, Poles, other Europeans and Russians. GC and CS interpreted column (c) – ‘departures by any means” – as being accounted for primarily by deaths. The returns from Auschwitz, the largest of the camps with 20,000 prisoners, mentioned illness as the main cause of death, but included references to shootings and hangings. There were no references in the decrypts to gassing. There were to be other references to concentration camps in the police traffic of later years, but they were infrequent†. 1. All of the available GPCC monthly proforma tables of daily inmate statistics for Auschwitz. The period covered is between January 1942 and January 1943. 2. Relevant extracts from seven of the fourteen available Bletchley Park GPCC monthly / periodic intelligence summary reports, GPCC series, OS1 to OS7. January 1942 to February 1943. It should be understood that full sets of inmate statistics for all of the camps mentioned in these reports, either do not exist in the GP message archives, or were not collated into tables. 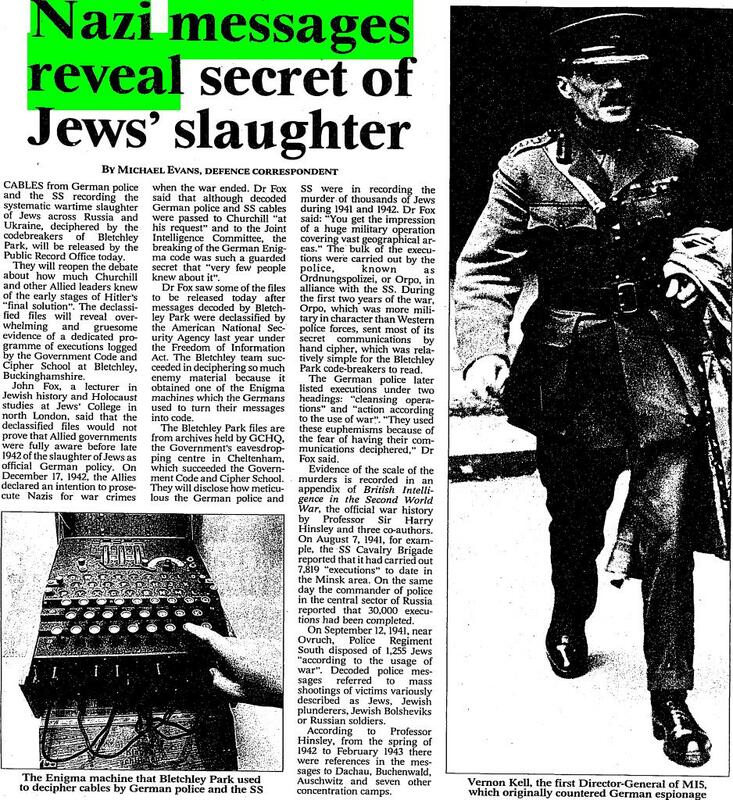 In 1998, Dr. Richard Breitman published the first book to examine these decrypts, Official Secrets: What the Nazis Planned, What the British and Americans Knew. He is Professor of History in The College of Arts & Sciences at The American University  and also serves as Historical Consultant to the Nazi War Crimes and Japanese Imperial Government Interagency Working Group, known as the IWG. The IWG advises US federal agencies and makes recommendations for the declassification of archival records. With the release of the Police Decodes to the British archives in 1997, Richard Breitman was able to make an initial examination of the so-called No.3 Traffic through which the prisoner returns were sent. His analysis was limited by the fact that he was working solely from the raw decrypts and could only speculate on the British interpretation. In late 1998, after the publication of Breitman's Official Secrets, the remaining files of the Police Section were released to the British archives; these included a file containing the summary analyses of the No.3 Traffic for 1942 and 1943. It is, therefore, now possible to examine the first attempts by British intelligence to analyze information received on Auschwitz. In 2005, Robert J. Hanyok at the US National Security Administration Center for Cryptologic History, published the paper, "Eavesdropping on Hell – Historical Guide to Western Communications Intelligence". This paper examines the broader history of Communications Intelligence (COMINT) with useful contributions on the German Police decrypts and their archival sources. Endnote , p.281: The data from the first months were decoded only in May 1942. By June, the decodes were almost contemporaneous with the radio reports. See the markings at the top of the data sheets in PRO HW 16/10. Auschwitz was designated as F. The British noted the death totals in hand on some of the data sheets and also highlighted some of the death totals in a summary of 26 Sept. 1942, PRO HW 16/6 part 2. Endnote , p.281: The table of numbers are in PRO HW 16/10. The source for the mortality figures quoted above should be understood to be PRO HW 16/6 and not PRO HW 16/10. Referring to the transcribed table from archive HW 16/10 below, this archive file contains a single page for each month, for each camp, comprising tabulated numeric inmate totals for each day of the month, as decoded from the daily GPCC inmate HORHUG returns sent by radio from each camp. The tabulation consists of several columns of various categories of inmate counts, with one row of data for each day of the month when the GPCC inmate statistics were both transmitted and decoded. On the days when messages were either not received or decoded then that daily row in the HORHUG proforma sheet for that camp is recorded as either "----" or "NOT SENT IN" or sometimes just blank. Where characters were missed in the decodes, they are often replaced with "-". The published extracts of the periodic / monthly summary reports from archive HW 16/65, describe various directives to the camps which changed the definition and composition of these columns over time. The exampe below of seven columns of inmate statistics, exemplifies the difference in the Auschwitz August 1942 table, from Hinsley's original description of four columns. To illustrate these Bletchley Park, HORHUG proforma tables, the following transcription is the GPCC Daily Inmate Proforma for Auschwitz, designated as "F", for August 1942. This archive table is titled ZIP/GPCC55/1.9.42 in archive TNA HW 16/10. From Hinsleys description above and from an understanding of the Bletchely Park analyses provided in the extracts of the periodic summary reports, published for the first time on this website, it is clear that only one column from the seven columns of GPCC HORHUG inmate returns, can include mortality figures. In all of the proforma tables, column C is known as "Departures by any means". It should be noted that the designations and composition of the figures in these columns, were not originally understood from any message decodes. The column definitions were deduced by the analysts at Bletchley Park. As can be seen in the summary reports, subsequent decoded messages revealed directives which ordered changes to the compostion of some of the column data, thereby revealing their evolving definition and consolidating understanding by the analysts at Bletchely Park. Hinsley's short description of the column C figures above, "GC and CS interpreted column (c) – ‘departures by any means” – as being accounted for primarily by deaths", requires some expansion. In the monthly summary reports, the Bletchely Park analysts describe the column C figures as, including totals for inmate transfers out of camp, to other camps and external labour assignments as well as mortality. Hence, the column C designation, "Departures by any means". The introductory "General" paragraph of Section III, Concentration Camps, in the monthly summary report OS2, dated 27 September 1942 and quoted below, which was unavailable to Dr. Breitman, provides the BP analyst's view of the likely cause for the August 1942 deaths at Auschwitz as being likely due to a typhus epidemic. August arrivals total 4989 so that they nearly balance deaths. that natural deaths will in future only be reported in writing. shot when attempting to escape from NIEDERHAGEN (219B/17). hung in HINZERT and nine more are shot. (223b/67, 226b/4). The BP analysts do note in the above report that for Auschwitz in August 1942, "Deaths must constitute a large proportion if not all of the "departures" mentioned in the GPCC figures which total 5325 for 19 days of August." It is therefore clear that, for August 1942 at Auschwitz, Hinsley's description of column C - Departures by any means, concurs with the analyst's view for that month at that location. It is possible that this description may have been sourced from this summary report when writing the official history. However, this interpretation may or may not always apply for the column C figures for every day or every month at Auschwitz, or any of the other camps. This is because the decoded messages relating to inmate transfers out of camps, for various reasons, will clearly affect the proportion of departures by any means which were caused by mortality. Understandably, the BP analysts note in their summary reports that they were not always certain of the precise breakdown of the column C figures. They also provide additional data, when known, for the totals of external departures which were not attributed to mortality. These can be found by reading the summary reports or by examining the original German language message archives from which all periodic summaries were compiled. It should also be noted that there are no regular figures or compilations for mortality figures. Statements do exist in the various series of summary reports that mention mortality such as Dr. Breitman's Auschwitz example. However, it should be clearly understood that these are GPCC messages which are separate from the daily message category of HORHUG inmate figures. In summary the title for column C, Departures by any means, is to be interpreted literally. Referring to Dr. Breitman's quoted summary statement for mortality at Auschwitz in August 1942. The column C HORHUG figures, Departures by any means, do not total 6,829 or 1,525, or their sum of 8,354, but rather the reported figure of 5,325 - as is reflected in the following month's summary report dated 27 September 1942 published here and in the extract above. Note also that the August 1942 column C data for Auschwitz does not include any breakdown for mortality among men or women. Similarly, no distinction is made for any mortality component among either, Political Prisoners, Jews, Poles or Russians. The message references in the summary report extract above, (223b/14,24,43,50) confirm that the quoted mortality figures are derived from another GPCC message and not from the HORHUG daily inmate returns. The following explanation should resolve any misunderstanding when trying to reconcile the column C arithmetic with the separate mortality figures quoted by Dr. Breitman. It was previously assumed that the missing mortality difference of 3,029 resulting from the sum of recorded deaths of 8,354 in August 1942 with 6,829 for men and 1,525 for women, could be accounted for by the 12 days when GPCC returns from Auschwitz were either not transmitted or not decoded. Further examination and reasoning has revealed this not to be the case. On Sundays and Public Holidays, no HORHUG data was transmitted. Abundant examples are found in the inmate tables where the closing inmate total for Saturday has been carried forward to become Monday's opening total. Simple arithmetic proves that any arrivals and departures that did occur on Sunday were incorporated into the arrival and departure figures for Monday. The main issue with the 8,354 mortality total transmitted in the additional, non HORHUG message and recorded in the summary reports, versus the HORHUG column C departures by any means total of 5,325 will become apparent below, when it is revealed in September that figures for the women's camp, which moved to Birkenau in August, begin appearing on a separate table, via a new set of HORHUG transmissions. The August 1942 mortality figure for women of 1,525 therefore does not form part of the column C departures total for the inmate table in August and until September 1942 at Auschwitz, only male inmate totals were transmitted in the HORHUG returns. This then reconciles the BP analyst's assertion above, of 30% mortality as a proportion of the GPCC (HORHUG) figures, that is, 6,829 is 30% of the closing August inmate total of 22,549 or 29.7% of the August average. Therefore the mortality discrepancy reduces to the difference between only the male mortality of 6,829 and the male column C total of 5,325 which amounts to 1,504. Of the 12 missing days of HORHUG returns in August, 5 days are recorded as "Not Sent In" and each of these days was a Sunday. Any departures occurring on Sundays are already accounted for in Monday's column C totals. The remaining 7 missing days are recorded as "---" and were therefore either, not intercepted or not decoded at Bletchley Park. This allows an average daily mortality rate to be calculated for the non-decoded days only, by dividing the male mortality discrepancy by the number of non decoded days. This results in an average daily mortality rate of 1504 / 7 = 215 per day, for each day that HORHUG data was not intercepted or decoded at Bletchley Park. This correlates well with the calculated average for daily mortality of 220 (6829 / 31) and also with the average daily departures by any means, of 222 men (5325 / 24) for 24 days of data included in the 19 days of decoded HORHUG returns for August 1942 at Auschwitz. Note that these calculations take no account of departures that may or may not have occurred for reasons other than mortality on the non-decoded days, such as external transfers and labour assignments. For the period, January 1942 through to August 1942, the HORHUG daily inmate statistics for Auschwitz, consists of one table on a single page for each month. For the period, September 1942 through to January 1943, the HORHUG daily inmate statistics for Auschwitz consists of two tables for each month. The first page table in September 1942, appears to be a continuation of the statistics for January to August and carries no additional sub-heading or designation. The first occurence of the second table at Auschwitz in September 1942, carries the sub-heading "V.P.A" and begins on the 1st September with a large column A Total Inmate figure of 16,629. Th new table is denoted V.P.A. for September 1942 only. At this stage the meaning of the acronym V.P.A is unknown. The BP analysts only used the V.P.A term twice in relation to Auschwitz, the second occurrence is in the corresponding reference in the summary report extract below. From October 1942 through to January 1943 the table on the first page of inmate statistics for each month is sub-headed "1" and the previous "V.P.A" table on the second page of statistics then carries the sub-heading, "3". There are no inmate tables for Auschwitz in the archives designated as "2" and no references to this designation in any of the summary reports. No Auschwitz "2" designation therefore exists. Inmate figures for "the BUNA works" are mentioned separately in three monthly summary reports. OS4 mentions "2000 Jews", OS5 mentions "2500 prisoners" and OS6 mentions "2210 men" as being employed there. The word Birkenau does not appear on any of the inmate tables or in any of the summary reports. The solitary reference to the term V.P.A at Auschwitz appearing in a summary report, occurs in the report covering September / October 1942.
majority of the departures are Jews. of Jews were arriving from Holland, Poland, and Czechoslovakia (259b/1). 21st 331 arrive, 116 leave, the figure for Poles is up by 226. VPA figures are also available for September and early October. August (223b/24), it is likely that these figures refer to it. When attempting reconciliation of the above figures with the inmate statistics in the "Auschwitz VPA" table on 20th September, it becomes clear that in the third paragraph, "20th Sept" is an error and should be read as "20th Oct". This is an obvious mistake, since the 6,774 figure quoted, is from the "Auschwitz 3" inmate table for 20 October 1942 rather than September 1942 VPA table as stated. This is just one of the reasons why great care and caution should be exercised when interpreting these summary statements. Special attention should be given to the punctuation used between successive statements and allowance made for occasional errors and erroneous capitalisation at the start of new summary statements. Otherwise, there is potential for some statements to be interpreted incorrectly as following on from the context of the previous statement. Examples of this potential problem exist in the second paragraph above and become clear when reconciling the quoted figures with the HORHUG tables of inmate statistics. The BP analysts refer to a women's camp at Auschwitz again in the following month's summary report. 6500 because arrivals balance departures. (G.P.D.C: F 3). A womens camp is mentioned again in the December summary report and rather confusingly, reference is also made to a message of 10 December 1942 directing that women should be accounted for separately. on 2 Dec; over 2500 prisoners are employed there (307b6,315b8,21). ending 7 Dec. (307b2,321b18): A few SS cases are reported (328b3,32). (F3) in the above paragraph refers to Auschwitz as being camp code "F" and "3" is the notation for the second page of HORHUG inmate tables. Refer to the Radio Call Sign section below for an explanation of the camp designation letters. The BP analysts again mention a womens camp at Auschwitz in the January 1943 summary report. an increase in all its columns raising the total from 5231 to 8255 on 25th Jan. It is worth noting that the term "VPA" is also mentioned in relation to Lublin which also begins recording two tables of inmate statistics beginning in October 1943. This event at Lublin is referred to in the monthly summaries as "the new camp". Two inmate tables are also available for Mauthausen from September 1942. The inmate tables for Lublin and Muathausen have not yet been published. It is strongly advised that all of the extracts from the published periodic summary reports, OS1 to OS7, are read in their entirety because they contain decoded instructions to the camps as to the composition of the various columns of HORHUG inmate statistics along with the BP analyst's interpretation of the meaning and use of these columns and descriptions of their reconciliation efforts. The BP analsysts also provide informative summaries of the general GPCC messages, especially with regard to the concentration camp inmate decodes. Various comments regarding important errata and revisions occuring in previous reports can be found in subsequent reports. The GPCC series of periodic / monthly summary reports therefore form an essential guide to the HORHUG inmate statistics. The monthly summary reports provide abundant evidence that the analysts in Hut 3 devoted a great deal of time and effort into the complex task of understanding the daily returns from each camp and into reconciling the increases and decreases in the number of inmates in the decoded column data with known movements of inmates between the camps, mortality, likely causes of death, arrivals and departures. The decoded messages and their summaries, provide examples of executions for escape attempts and criminal activity and also staff disciplinary action and suicide. The prevalance of disease, chiefly typhus, is well documented and appears in all seven of the monthly camp summaries published here. Some figures are provided for deaths due to typhus, along with corresponding counter measures such as orders for soap, vaccine and medical supplies. "Fleckfieber mittel" translates as: Typhus fever agent / medium. It is interesting to note the analyst's inclusion of the reference "Roentgensterilisation", in the context of typhus. 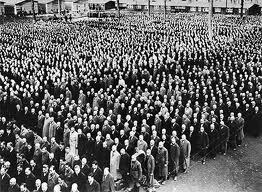 The shortage of man power leads to a considerable employment of prisoners outside as well as inside concentration camps. There are constant enquiries regarding the skills and trades of prisoners with evidence of demand for prisoner labour for armaments works, knife grinding, toy factories and construction projects such as road building, quarrying, cement works and cable laying. Messages describe the available pool of inmate work experience, along with requirements for specific skills including watchmakers, bakers, butchers, bricklayers, clerical workers, carpenters, glass blowers, musical instrument craftsmen, joiners, tinsmiths, botanists and horticulturalists. References are made to the processing of clothing, the industrial use of human hair and the manufacture of toys. The text within the monthly summary reports is heavily annotated with alpha-numeric references in parentheses at the end of the summarised statement. These annotations are the original document codes used by the Bletchley Park analysts to refer directly to the corresponding daily message decrypts. A list of the message references used in each of the monthly summary reports, is included at the top of page 1 in the report. employed on repair work, and the finishing of children’s toys. (70/28). (70/28) is therefore the reference to be used to look up the corresponding message among the many pages of daily decoded messages, within the corresponding TNA HW 16 archive. The message decrypts are filed in various archival volumes according to date and subject. The following is an example of a message summary statement appearing in a monthly summary report, understanding it's corresponding message reference and how to locate that message reference in the UK archives. Use the following procedure as a guide to locate the German language message decrypt in the UK National Archives, referenced by (113/5). Note that the actual archive pieces are unfortunately, not available online, so a visit to London is required. The National Archives, Discovery online catalogue must be used to first search for the GC and CS archives in HW16. The more expansive description should then be read to discern the date range of messages included in that piece, in this case, 9th June 1942. For a message dated 9th June 1942, TNA HW 16/19 is the piece which contains the original German decrypt message because the full description for HW 16/19 shows that this piece includes messages for the date range 1942 June-July. This is as much as can be achieved online. The remaining steps can only be done once the relevant piece has been withdrawn from the archive in London during a visit. Using the annotated reference from the summary report above, in this case, (113/5). The first number, (113/5) is used to locate the relevant page in the volume HW 16/19. In this example 113. Once the correct page has been located, use the second number of the message reference from the summary report, (113/5) to locate the sequence number of the message on that page. In this example: 5.
und ..groups missed... quarantäne von hier adgehen..goes off..
DR. VON BODMANN, SS Obersturmführer. Selected pages from each of the seven GP monthly summary reports, OS1 to OS7, which reference concentration camp messages and the HORHUG inmate returns, are published for the first time on this website. The date in the title of each summary report is the date of that report. Note that there is some overlap in the reporting periods. Hence "periodic" and not strictly "monthly". TNA file HW 16 / 65 actually contains fourteen monthly summary reports; OS1 to OS14. However, reports OS8 to OS14 unfortunately do not contain any mention of further GPCC inmate returns. This is because the daily GPCC camp HORHUG inmate returns are noted to have ceased in the monthly summary report for February 1943 - OS7. Various sources state that subsequent HORHUG inmate returns were sent by courier or by landline. Sources for those assertions are unknown. Not all of the pages from the archives for the OS1 to OS7 monthly summaries have been transcribed because the omitted pages contain summaries of other GP messages not related to the GPCC HORHUG figures and are therefore considered irrelevant to the subject of concentration camp statistics. The first monthly summary report, ZIP / OS 1 / 21.8.42, has been more extensively transcribed to enable the reader to appreciate the structure of all of the summary reports and to give a flavour of the other subject matter, not relating to the concentration camps. Page 1 of each monthly summary report OS1 to OS7, has been transcribed to provide proof of the title and archive source as well as the date range of the GPCC message data summarised. The original Bletchley Park German language decrypts, the monthly proforma sheets of daily inmate HOR-HUG returns and the GP monthly summary reports have all been publicly accessible in the UK since their release from GCHQ to The National Archives (TNA, formerly Public Records Office, PRO, London) in 1997 and 1998. A substantial subset of these archives were given to the US authorities for use in War Crimes investigations and subsequently released in the US in 1996. The UK archives can be accessed using the following selected references, with descriptions provided by The National Archives in London. This list is not intended to be comprehensive. Refer to the National Archives Discovery Catalogue for all of the HW archives inherited from the GC and CS. 1914-2009 Records created or inherited by Government Communications Headquarters (GCHQ). Records created and inherited by the Government Code and Cypher School (GCCS) and its successor the Government Communications Headquarters (GCHQ) relating to interception of enemy communications and ensuring security of government electronic communications. Government Code and Cypher School: German Police Section: Decrypts of German Police Communications during Second World War. German Police Section: 1940-1945 Bound volume of BP GP periodic summaries. GP Section (GPS) periodic highlights summary reports, ZIP/OS 1 covers period Jan-Aug 1942, subsequent reports issued monthly. Some GC & CS archives are also available in the US at the National Archives and Records Administration (NARA) in College Park, Maryland. References are provided in "Eavesdropping on Hell – Historical Guide to Western Communications Intelligence", 2nd Ed., (NSA 2005) - Chapter 3, Sources of Cryptologic Records Relating to the Holocaust by Robert J. Hanyok. The GPCC Radio Call Sign List shows three characters for each of the concentration camps used to transmit general camp administration messages including HORHUG type inmate data. These call signs are listed on page 1 of the archive folder containing the GPCC HORHUG imate tables in TNA HW 16 / 10 and their descriptions and camp assignations are reproduced below. It is therefore a notable exception that, according to the interpretation of the "Hofle Telegram" message, by Peter Witte and Stephen Tyas in their paper, "A New Document on the Deportation and Murder of Jews during "Einsatz Reinhardt 1942", a different system of camp notation appears to have been employed, which appears in the second and more fully decoded Hofle message. Based on current examination and understanding of the available archives in London, no other decoded messages relating to either, inmate statistics or more general GP messages, have so far been located which use the first letter of the camp name as an identifying letter for that establishment. With the exception of the, as yet unpublished, daily inmate statistics for January 1942 to January 1943 from the establishment at Lublin, GPCC:J, designated radio call sign OMJ, it can also be stated that there are no monthly proforma tables of any daily inmate returns for Belzec(B), Sobibor(S) or Treblinka(T) in arhive HW 16/10. Neither Belzec, Sobibor or Treblinka are mentioned in any of the periodic summary reports in archive HW 16/65. Likewise for the terms Majdanek and Chelmno. Although the entire message archive has not yet been examined, it is currently assumed that, with the exception of the establishment at Lublin, as there are no mentions of these establishments in any of the summary documents, then it is unlikely that any GPCC HORHUG type inmate returns exist in the original message decode archives for the Action Reinhard camps. It is unknown if Chelmno, Madjanek, Belzec, Sobibor and Treblinka were assigned their own radio call signs, because these specific camps are also not listed in any of the radio call sign lists. Another potential confusion exists for the radio call sign used in the Hofle Telegram to denote both messages as originating from Lublin as OMQ. The above GPCC radio call sign list, used for the daily HOR-HUG inmate returns and general administration messages, shows Lublin as OMJ. 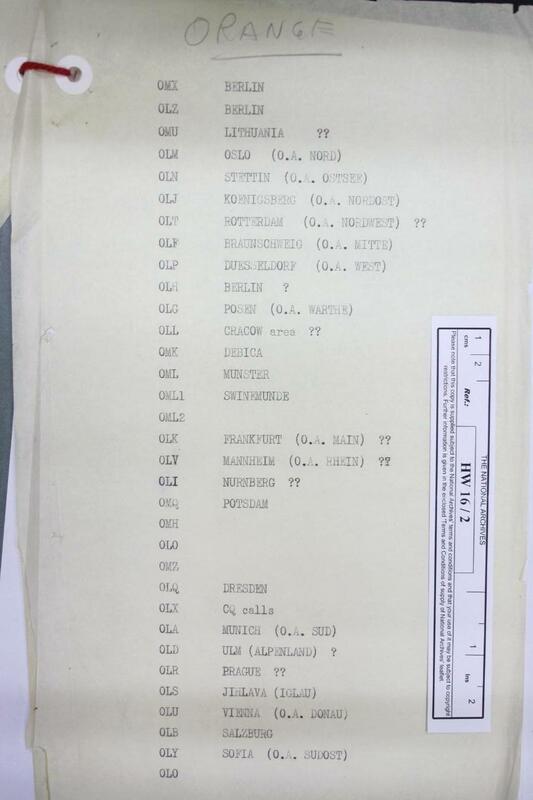 The ORANGE Call Sign List in archive TNA 16/2, shows POTSDAM as OMQ. Alternatively, OMQ is assigned to Lublin in the Wireless Traffic extract of a monthly summary report shown below. The Wireless Traffic section explains that several important stations use more than one frequency, therefore this may inform understanding of the two different calls signs, OMJ and OMQ being assigned to Lublin for different purposes The GPCC call sign for Lublin OMJ is certainly used as the "GPCC: J" heading on the HORHUG inmate tables in archives HW 16/10, and therefore relates to concentration camp inmate figures for the establishment at Lublin. The OMQ call sign is described below as being used for administrative messages emanting from SS. Police Fuhrers etc., and therefore seems to have been used as the call sign for the central administrative entity at Lublin as distinct from the concentration camp establishment(s) at Lublin which used radio call sign OMJ for GPCC type messages. Nothing so far explains the OMQ call sign also appearing in the ORANGE Call Sign List for POTSDAM. On present understanding, this indicates that the Hofle message was likely transmitted on the 4906 frequency using an Enigma cypher, assigned to the ORANGE I covername series of keys, described by Hinsley as General Purpose SS keys. The call sign destinations shown in the Hofle message decodes are, OMX for BERLIN and OLQ for KRAKAU. Radio call sign OLQ appears in the ORANGE call sign list as DRESDEN not KRAKAU as shown in the Hofle Telegram. The ORANGE Call Sign List shows call sign OLL designated as the "CRACOW area ??". But the most famous of all Orange cribs were the Weather messages from Krakau (OLQ). It may well be the case that one or more of these call sign lists contains errors or may contain out of date and / or redundant information. It seems unlikely that call signs may have been reassigned, although this possibility cannot be ruled out. It is certain that different call signs from the same location were used for different purposes, using different radio frequencies and / or cypher systems for messages sent from the same location. Lublin for example, sent HORHUG inmate returns using GPCC call sign OMJ and also used OMQ for Orange type Enigma messages for other matters. The Hofle Telegram is summarised in the last paragraph of the Miscellaneous section on the last page of the GP Monthly Summary Report ZIP/ OS 6 / 28.1.1943. The final mention of Einstaz Reinhardt in the summary reports occurs as the last paragraph of the Concentration Camps section on page 4 of the GP Monthly Summary Report ZIP/ OS 7 / 27.2.43.
or destined for OLL and OLU are occasionally relayed on this frequency. OML, OMR and OMS work occasionally on this frequency. available have been analysed in some detail. administrative and come for the most part from SS.v.Pol.Führers, Pol. Trng. units (OLP and OLV are reserved for special treatment). Thus the examples of: GPCC:F in the monthly summary reports relates to AUSCHWITZ and GPCC:A to ORANIENBURG and so on. The concentration camps mentioned in the OS1 to OS7 monthly GP summaries are "all controlled by ORANIENBURG – OMA, but uses call sign OMZ when calling other camps." and "GUSEN uses the same call sign and may be controlled by MAUTHAUSEN – OMC." 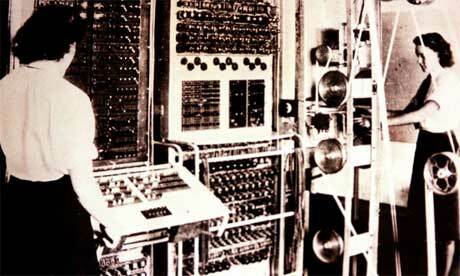 The following background information on the history of the Bletchley Park GPCC and HORHUG decodes may be useful. Many detailed books have been written about the activities of the wartime code breakers at Bletchley Park (BP), so only a brief overview is here required in order to illustrate some of the history, terminology and procedures used in the interception and analysis of wireless telegraphy message traffic used to compile the daily proforma tables of inmate data and the monthly intelligence summary reports of the German Police Concentration Camp (GPCC) vital statistics. From the early days the Military Section in Hut 5 at BP had been reading the German Police codes. In December 1940 a party from BP had joined a French team at La Ferté-sous-Jouarre on the Marne for work on the police codes. The fall of France had led to a significant loss of intercept capability of the German police signals, though BP continued to break a considerable number of the German police messages, which were largely enciphered in a double transposition hand-cypher. (The Gestapo arm of the Police used an Enigma key, called TGD by BP which they never broke. According to the Official Historian its non-solution is “to this day one of the classic mysteries of Hut 6”. But BP had been reading the SS Enigma key, Orange, used for general administration purposes including the concentration camps, since December 1940; the concentration camp death-returns became such a regular feature that BP used them as a crib for breaking Orange). With the invasion of Russia more police signals were received on better frequencies for interception and the Germans introduced a new hand cypher key that was soon broken by BP. So from July 1941 onwards John Tiltman’s military section was reading a considerable number of messages from the German police in Russia. On the 18th July they read a police message reporting that 1,153 “Jewish plunderers” had been shot. There followed a regular flood of messages enumerating the shooting of Jews and partisans. Tiltman’s section began sending reports on these atrocities to MI14, the research section of Whitehall’s Military Intelligence service. There was very little interest shown so BP gave up sending the regular messages on the execution of the Jews, though Churchill himself did respond in August in a characteristic manner. (There was one response from a pedantic Colonel in MI14, restricted to pointing out that BP was mixing together the statistics from” two entirely different parts of the German police service”). But throughout the war BP continued to produce weekly summaries of police operations behind the Russian front. The work at BP on the Police cyphers used some 500 people by the peak in the summer of 1944. One reason for maintaining this large effort was that the material often provided cribs for breaking Enigma keys. Another was that the type of hand-cyphers used by the Police was very similar to that used for the field communications of the German Army and Air Force and as a fall-back reserve when Enigma was unusable at times of crisis as happened in Russia and then in Europe in 1944. It came to be appreciated that this team at BP provided excellent training for new cryptographers before they transferred to work in the field. Whether it really was sensible to employ so many people on such relatively unimportant work must remain a matter for argument. The “History of Hut 6 in Three Volumes”, written in September 1945 and “The Hut Six Story – Breaking the Enigma Codes” by Gordon Welchman and “Life in and out of Hut 3”, by William Millward, are among the books which provide the relevant histories of these activities at Bletchley Park (BP). The Hut 6 function, known as the Cryptanalysis of Army and Air Force Enigma, was the centre of Bletchley Park’s Enigma operations. Hut 6 became involved with non-Enigma GPCC messages when they were passed to them by the German Police Code section in Hut 5’s Military Intelligence, in the hope that they would correlate or assist with the Enigma decrypt effort and intelligence analysis. This proved to be the case as some of the repetitive sequences used in the GPCC messages, were used as cribs for other SS Enigma messages. In the early days of Hut 6 the number of Air and Army groups intercepted was so small that the provision of English covernames was a very minor problem. As soon as the continuity of a group was established it was named after a colour; thus the G.A.F groups in December 1939 , were Red and Blue, the Army Group, Green. Colour names were chosen because messages could then be identified by marking them with correct coloured pencil. Before a definite long-term continuity had been established groups were distinguished by frequency names, e.g. E/4700 Group, E/5420 Group. 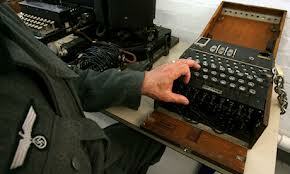 "The SS, the elite troops of the Nazi Part’s private army, also made use of the Enigma machine. An SS Enigma key (called Orange I at GC and CS) used for general administrative matters, including the organization of concentration camps, was broken in December 1940, and read, with many ups and down, until late in the war. Another key, Orange II, which carried mainly administrative communications between Berlin and SS formations in operational areas, was broken from early 1942 until it was replaced by another key – Quince – later in the same year." HOR-HUG Reports. The contents of 4152 Orange dealt with some of the concentration camps that have since attained notoriety, (such as Auschwitz, Dachau, Oranienburg), and the next sensational advance in S.S. cryptography was also connected with this frequency. For several months a number of non-enigma messages had been sent out from some six or seven stations to Berlin early in the morning – in fact between 7 and 8 a.m. These messages were eventually passed on to us as it was thought they might tie up in some way with the Enigma traffic. Inspection revealed the following characteristics. The messages, known as HOR-HUG reports from two frequently occurring code groups, were short, consisting of about ten groups of letters, followed by a few more or less invariable code groups. In the message proper the number of letters in any group never exceeded four, and on any one day only ten different letters were used. The last point strongly suggested a figure code and on this hypothesis one day’s traffic was broken early in April 1942. 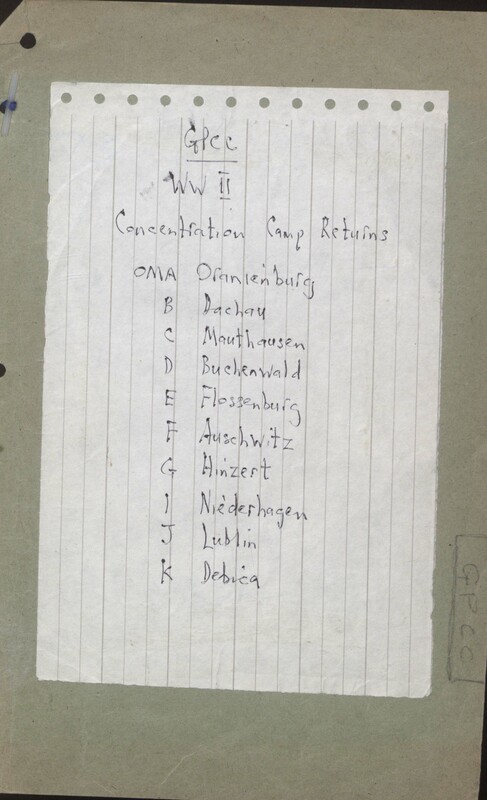 The messages contained in tabular form the vital statistics of concentration camps: the first four columns denoted (A) number of inmates at start of previous day, (B) new arrivals, (C) departures by any means, (D) number at end of day. Thus A+B-C=D, and for any station D on one day was A on the next. The decoded inmate statistics of the daily returns from each concentration camp, known as the GPCC HOR-HUG reports, expanded over time from the initial four columns. These daily figures were then compiled onto monthly sheets for each camp. All GPCC messages, including the HOR-HUG returns, were then passed to the analysts in Hut 3 which provided the Intelligence: Translation and Analysis of Army and Air Force decrypts function. Various summary reports were passed to Governement departements in Whitehall, with additional daily and weekly summaries to the Head of Military Intelligence, “C” and the Prime Minister. The analysts also produced monthly intelligence summary reports, extracts of which are published here, including summaries of these GPCC daily HOR-HUG camp statistics. Dr. Richard Breitman, Official Secrets: What the Nazis Planned What the British and Americans Knew, (Hill and Wang, 1998), Epilogue, p. 244. Dr. Nicholas Terry, Conflicting Signals: British Intelligence on the ‘Final Solution’ Through Radio Intercepts and Other Sources, 1941-1942., Yad Vashem Studies XXXII, 2004, pp. 351 - 396. Breitman, Official Secrets, Chapter 7, Auschwitz Partially Decoded, p. 115. There also exists a rather more comprehensive study on the GP decodes for Lublin / Majdanek, by Tomasz Kranz et al, Head of the Majdanek Museum. We welcome your comments and suggestions. Please use the Contact Form.